Back of the Book is celebrating 32 years on the air! The format of the program is what is known, at WBAI at least, as “Free Form Live Radio.” Basically, it's whatever Pickles of the North and I think is good radio to put on the air in that one hour time slot. Back of the Book now airs alternate Saturday mornings at 5:00 AM. Web page for the April 20, 2019, program. Web pages for previous Back of the Book programs. We have a Web stream operating these days. This is the official WBAI Web stream. It's usually working but if it isn't please let me know. WBAI has managed to lurch toward the current century by providing not only the Web stream of what's on the air at any one time but also an archive. Unfortunately, WBAI's archives are now on a page that doesn't allow easy access to any one program. Quite a step backward from the previous archives page. Here's the current official WBAI archive page of all of WBAI's programs. Currently there is no easy way to go right to the latest Back of the Book program in this version of the archive. You'll need to use the “Display” drop down menu and scroll to Back of the Book. Since WBAI's General Manager has told our pal Sidney Smith that he's banned for life from WBAI, for no stated reason, Sidney's program Saturday Morning With the Radio On isn't in the archives anymore. What is? Any resemblance between WBAI and anything stable is purely a figment of someone's imagination. As I type this we are more than 18 years past one phase of our big crisis and are currently mired in what may be the end of the following phase of it. Currently, in the early Winter of 2018/2019, most of the Paid Staff have been fired from WBAI. Will there be a purge soon that includes those of us on Back of the Book ? I have no idea, but it is entirely possible. 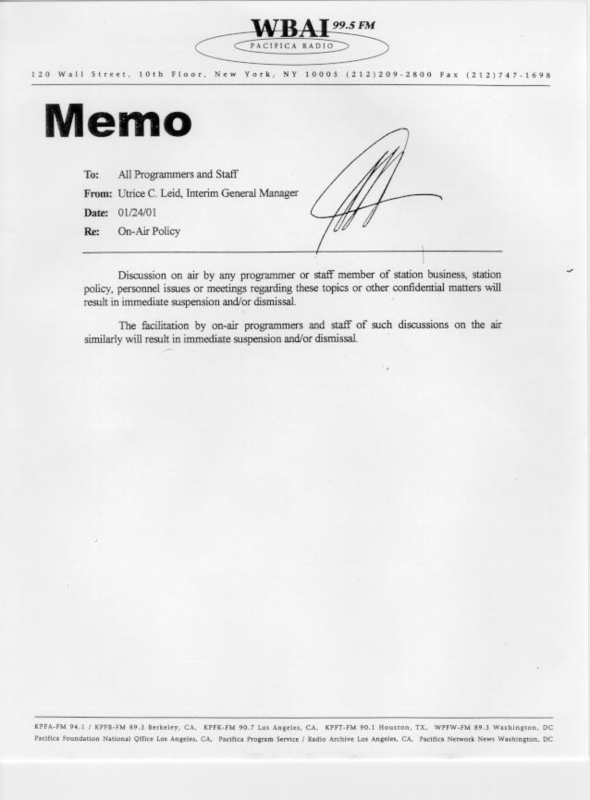 Certainly the General Manager has abusively banned Sidney Smith from WBAI and has refused to say why he's banned him! This ties in with the fact that in 1999, WBAI/Pacifica Management got the NLRB to order the Unpaid Staff out of the Union at WBAI, which also destabilized things. I'm a bit amazed that WBAI and Pacifica have survived for the past 19+ years. Here are the dates when Back of the Book should air over the next little while. All programs run from 5:00 AM (ET) to 6:00 AM (ET) on WBAI 99.5 FM. The programs are numbered consecutively for the year they're in. We generally talk about our lives and what's going on, and these days since the gag rule has been revoked we get to talk about WBAI issues as well as the scientific and social things that seem important to us and to which we think we can bring a perspective different from what folks generally hear in the mass media. It used to be that I referred visitors to my local WBAI Folio page for details on Back of the Book . Unfortunately, our Folio is no longer being published. The contents of this Web page and subsequent Web pages on this site are copyright © 1998 - 2018, R. Paul Martin.